The rich and varied career of folklorist William R. Ferris spans four decades. As a young man in the 1960s, he began documenting African American traditional arts in his home state of Mississippi. In 1969 at the University of Pennsylvania he completed one of the earliest dissertations on Delta blues music. From the 1970s to the late 1990s Ferris taught at Jackson State University in Mississippi, Yale University and the University of Mississippi. During this time he documented the lives and work of southern artists—men and women, black and white—from musicians to basket makers, and from fiction writers to embroiderers. 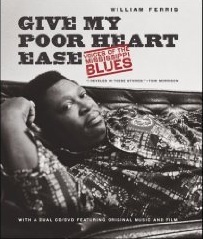 The majority of the current collection stems from materials digitized during the making of Dr. Ferris' latest book Give My Poor Heart Ease: Voices of the Mississippi Blues. Gail Goers was responsible for most of the digitization. The images are JPEG copies from the original TIFF images. Metadata and web development done by Adam Mack, Kjersti Kyle, and Tim Obert.